In a nutshell, the Sleeptracker® Monitor is about small day-to-day non-invasive improvements for Ms. and Mr. Everyone using the principles of CBM (Cognitive Behavioral Modification) that add-up over time to improved sleep in the comfort of one’s home. 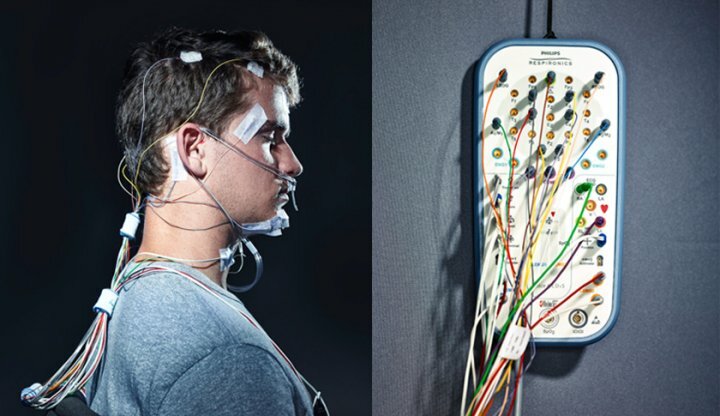 Polysomnography (PSG) is about wearing a battery of sensors and monitors for diagnosing potentially life-threatening sleep disorders such as severe apnea in one or more sessions in a sleep lab. Both PSG and the Sleeptracker® Monitor are complementary and “compatible.” Big data and AI are what drive the innovation in the Sleeptracker® Monitor. The Sleeptracker system is focused on Cognitive Behavioral Modification and understanding what simple practical matters impact our daily sleep. The idea is to improve sleep for Ms. and Mr. Everyone with small adaptations suggested by AI working with big data sets. With millions of users and millions of nights of sleep to draw from, the Sleeptracker AI engine helps to give us immediately actionable personal insights as to what impacts a night of sleep. The AI engine observes short, medium, and long-term personal daily sleep patterns and compares the Sleeptracker user to hundreds of thousands of people “just like me” to provide actionable personal insights. Through this process, the Sleeptracker user can experience and quantify for themselves the effects of making measured changes to their sleep routine. The data show key impacts to our sleep quality are directly tied to daily exercise, proximity of meals to bed-time, alcohol consumption and stress. These behaviors which directly affect sleep are handled privately, confidentially and securely for the purpose of understanding and further improving using the principles of CBM. Throughout the night, and completely non-invasively, the Sleeptracker® Monitor continuously monitors breathing rate, heart rate, motion, wake-up and out-of-bed events. In time, monitoring will expand to include air quality, ambient noise and temperature of the sleeping environment to provide greater insight into environmental impacts to one’s sleep. For example, sleeping with a partner, pets on the bed and the impact of children on sleep are important factors which the Sleeptracker AI-engine takes into account. With CBM, the AI-powered coaching agent suggests simple actionable tips that help improve sleep for Ms. and Mr. Everyone, a little at a time. By contrast, Polysomnography (PSG) is focused in today’s medical world in identifying candidates for CPAP machines. That’s very important and probably the most actionable matter that is derived from PSG study as sleep apnea is a potentially life-threatening condition. One must remember, the Heisenberg Uncertainly Principle (HUP) shows the measuring apparatus of an experiment impacts the outcome of the experiment. Anyone who has participated in a polysomnography study knows how invasive PSG can be to sleep. In fact, often the PSG requires patients be monitored multiple nights to obtain a clear understanding of their tendency to apnea due to the invasive nature of the equipment and restlessness from not sleeping in one’s home environment. Most agree that an important part of sleep hygiene is a consistent schedule and conducive sleep environment. Diagnosing apnea and the prescription of CPAP machines is a multibillion-dollar business and of course is indispensable to those diagnosed. The Sleeptracker® Monitor is meant to be a complimentary product to PSG and not meant to diagnose, but to provide insight into sleep patterns and the measured changes one can make to improve one’s sleep routine. Correlation of the Sleeptracker® Monitor to Polysomnography is accomplished through a fully operational onsite PSG lab staffed by a licensed sleep specialist. While the focus is on CBM rather than diagnosing apnea, this ongoing calibration ensures the Sleeptracker® Monitor delivers greater than 90% accuracy compared to invasive sleep monitoring. Accuracy is focused on time to fall asleep, sleep efficiency, wake-up events, respiration rates, heart rates and REM sleep. In conclusion, as the data sets grow with Fullpower’s advanced AI methodologies, we learn more and more about our sleep and how the quality of our sleep compares to “people just like me” in a non-invasive sleep environment. Using CBM, we make small modifications that help significantly improve our sleep and health over time. For severe sleep disorders, PSG and a trained MD are key for prescribing a CPAP machine and treating the sleep disorders. For everything else, the Sleeptracker® Monitor offers valuable insight and actionable coaching into one’s sleep routine for a better night’s sleep.